The first big event of the Golden Knights offseason was completed when the 2018 NHL Entry Draft came to an end Saturday afternoon. This was only the team’s second entry draft in their short existence and the Golden Knights were looking to add depth to their top-heavy prospect pool. Although they only had one pick in the first three rounds, Vegas was able to come away with some great pieces to add to their system. Through eight picks, Vegas added three forwards, four defensemen, and a goalie. The NCAA was the league most targeted, with four of their selections coming from the American collegiate system. With a variety of backgrounds, here are the eight newest members of the Golden Knights family. Morozov is an 18-year-old center from the Russian Junior Hockey League (MHL) who Vegas chose to make their first pick of the 2018 draft. Ranked 72 overall by Future Considerations, this young forward impresses at both ends of the ice. Last season while in the MHL, Morozov posted 23 points in 30 games as well as five points in seven playoff games. He also played great in the Under 18 World Junior Classic for Russia, tying for second place on the team in points behind fellow 2018 draftee Kirill Marchenko. His rights got transferred in May from the floundering HC Yugra to one of the league’s most consistently successful franchises in SKA St. Petersburg which should help his development. Morozov has evident talent both offensively and defensively, but Vegas does have to worry a bit about the so-called “Russian factor.” It is possible Morozov will want to stay in Russia once he makes it to the KHL rather than making the journey across the ocean. Vegas has to keep in contact with him and his agent, making sure they know Vegas wants him and his skills in the NHL. The next two selections were both made via picks traded to Vegas over the course of last season. Despite what his name suggests, Demin was born in California and is currently committed to play at the University of Denver. 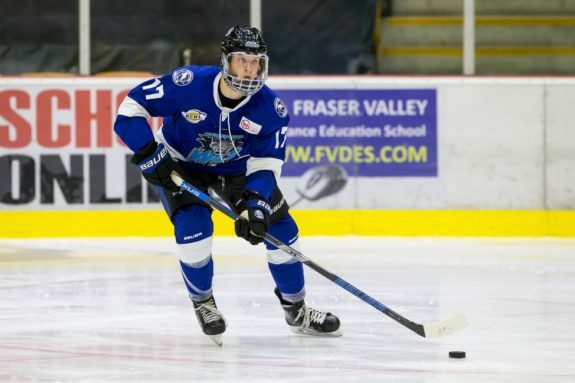 He is an 18-year-old defender that flew up draft boards after a spectacular season in the BCHL where he played some of the best defense in the league while putting up 45 points in 57 games. Demin leans towards a defensive game and looks to project as a good penalty-killing defenseman that could improve his game substantially in college. He has a great potential and it was surprising to see him slide to the fourth round after he was projected by some to go significantly higher. TSN’s Bob McKenzie, for example, had him projected to go 69 overall. Another 18-year-old center, Cotter is committed to Western Michigan after spending his last season in the USHL. His game is offensively focused, as he scored 39 points in 51 games last season in addition to eight points in seven playoff games. His performance earned him a spot on the USHL All-Rookie Team. Western Michigan had a great breakout season last year, so Cotter is in good hands during his development. Vegas went off the board with their first pick in the fifth round. Kruse was unranked by all the main sources but shared a connection with general manager George McPhee in their choice of college: Bowling Green. 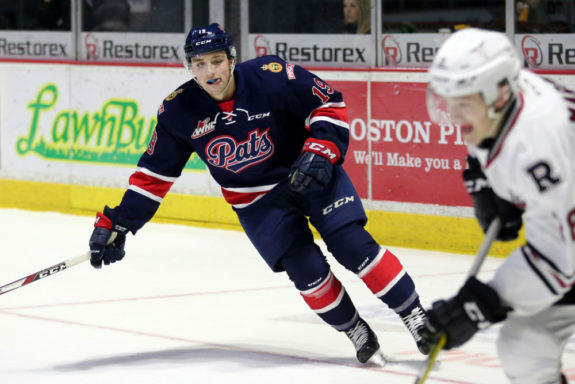 He is a 19-year-old left winger who is listed at 5’9’’ and 154 pounds. Despite his size, he managed 33 points in 41 games and was named to the WCHA All-Rookie Team. As the first pick Vegas made from the Canadian junior leagues, Corcoran is a 17-year-old defender with the Windsor Spitfires of the OHL. At 6’2’’ he has played both forward and defense in the OHL, including a season for the Golden Knights’ AHL coach Rocky Thompson. In his post-draft interview, he compared his game to Matt Niskanen of the Washington Capitals. Vegas rounded out their four college picks with Diliberatore who has committed to Quinnipiac University for next season. The 18-year-old defender has spent the past two seasons with Salisbury, a Preparatory High School in the U.S. where he collected 35 points in 58 games. He describes himself as a two-way defenseman with an emphasis on his skating ability. Bouchard slid significantly on draft day, with the Golden Knights hoping this late pick can be a steal. Projected to go at 91 by Future Considerations, this 6’4’’ defender has spent two seasons with Baie-Comeau Drakkar of the QMJHL. Through 128 games he has 55 points but focuses on playing a defensive game with his size. 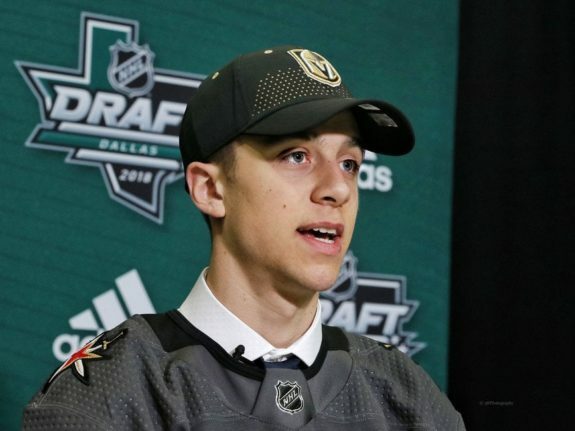 With their final pick in the 2018 draft, Vegas selected a goalie from the London Knights of the OHL. McPhee actually traded his team’s seventh-round pick next season with the Pittsburgh Penguins in order to get this one. Kooy was the backup for his team last season, playing 24 games and ending with a 3.11 goals-against average and a .904 save percentage. He won the Dinty Moore Trophy last season, given to the rookie goaltender with the best goals-against average, and will look to taking on a starter’s workload next season.